Oh, 4 of The Evil 10! Akatsuki members are really stylish! Thanks a lot and Keep up the good job! hidan & kakkuza r awesome characters. Tobi e Kakkuza are the best! thanks for finding this for me dude, love it as my wallpaper. Why do all the awsome characters need to die?!?! I'm not a huge Akatsuki fan, but hey! This guys can make the darkest day ... turn darkest yet! 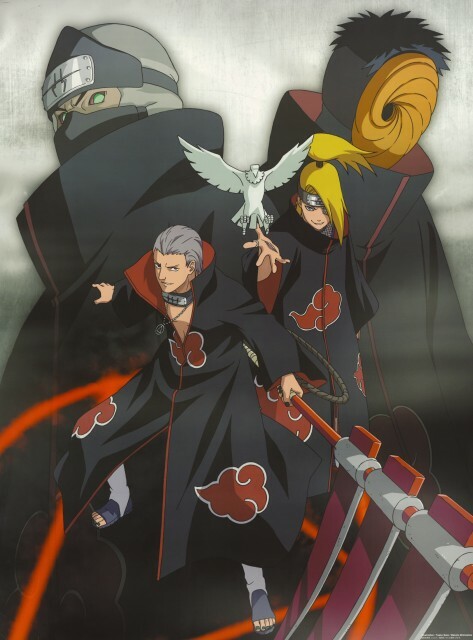 Nah, jk, Deidara and Toby are too halarious to be scare of them. The scan is great. Thank you for sharing. nice and thanks for sharing!